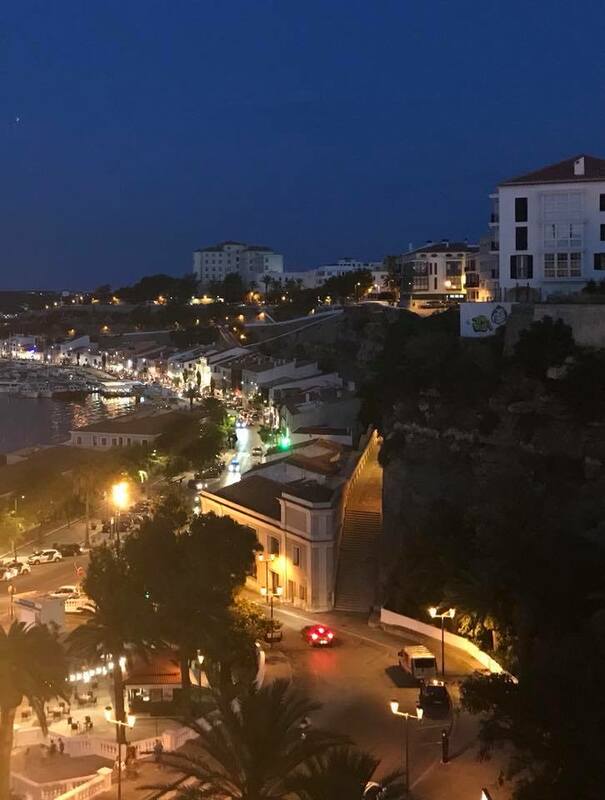 I didn’t know what to expect when Jennifer booked a trip to Menorca a while back and I must confess that I do tend to rely on her for such things. This is because my attention to detail with regards to booking anything online is useless and there is a high chance we would end up in the type of place that I might not ever be forgiven for, spending a week with Barry Butcher, a Charlton fan who doesn’t like darkies (except Frank Bruno). The only criteria I ask for on a holiday nowadays is somewhere I can be left alone by tour reps who want to tell me how to enjoy myself. Them and grown men in football shirts. I just don’t get the football shirt thing. I can understand it with young lads but what does a bloke of 50 get out of wearing an Aston Villa shirt on holiday? I guess the hope is that someone will approach and say, “Blimey mate, your club is struggling innit?” and this will, in turn, lead to a week of inane football chat and lager, followed by a Facebook friendship where they can both share posts about a Muslim allegedly trying to ban a picture of a bacon sandwich. Each to their own and all that but I discovered a long time ago that a hotel dominated by one nation, be it Germany, Britain, Russia, or anywhere else, is unhealthy and occasionally threatening. There are sections of many European nations, Britain and Germany in particular, who want to recreate their own nation in the sun by travelling to Spanish resorts, which is fair enough if you like that sort of thing, but I really don’t if I am honest. So, it was with some relief that the place we were staying at (Punta Prima) had no dominant nationality and was a mixture of Spanish and French holidaymakers as well as a scattering of folk from the UK and Northern Europe specialising in keeping themselves to themselves. That old dear from Blackburn who made the news recently (after complaining Benidorm had too many Spanish people) would have been incandescent with rage at this place. Punta Prima itself is quiet, with a seafront offering a few shops, traditional restaurants and a small, pretty, but quite rocky beach. 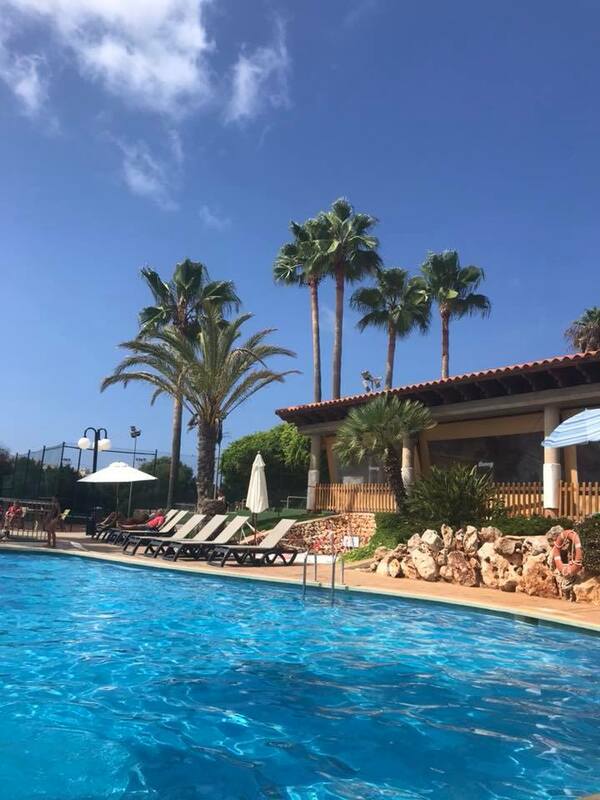 We were staying at The Hotel Occidental which is quite large with a scattering of swimming pools and bar areas along with excellent breakfast and dinner facilities that were largely catering for Spanish tastes, what with it being a Spanish island and all that. There were plenty of reps knocking about if you needed them, but they were subdued and not the type who nag you to death to part with 100 Euro’s to go on a crrrrrazy boat trip or flip you off your sunbed and into the pool for refusing to join in with the karaoke. My association with holiday reps ended in the mid 90’s when I got booed out of The Red Lion in Lanzarote for refusing to get involved in an ‘introduction to fellow holidaymakers’ event. This made my one-year old son cry as the poor little sod thought we were under siege in alien territory, which, in effect, we were. I’ve avoided the fuckers ever since. There were things you could get involved with if you so wished and I did roll back the decades by playing in a football match where Aden (Jennifer’s boy) and I were the only British participants among some flamboyant French and Spanish players who appeared to have been born to have natural composure when a football lands at their feet. It was like a micro example of why England will always struggle to win a major football tournament. Aden and I were all guts and honest endeavour whilst our teammates barely broke into a sweat. 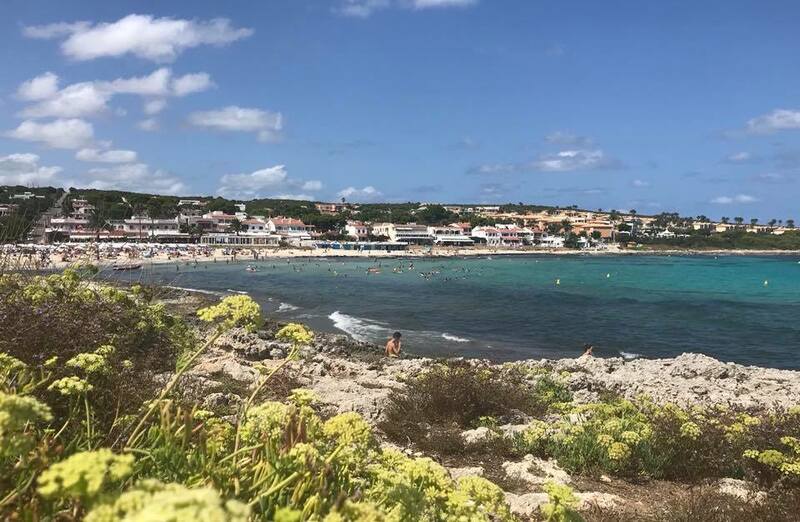 With Punta Prima being a small place with a limit to what you can do (unless you just want to sunbathe) a trip to Mahon is a must. We went there thinking it would just be a small port, but it is a bustling town with loads going on. It is a fascinating town too, with an intriguing and often brutal history that seems ridiculous in such a beautiful place. I sincerely recommend a boat trip around the harbour where you get a good account of the disused prisons, forts and hospitals based on the little islands. It is difficult to take it all in because, where Menorca is geographically situated in the Mediterranean, it is all very complicated. Britain invaded it at least twice and many of the buildings still emanate a very British influence. Everyone takes their holiday for different reasons and I can see how aspects of Menorca might not suit some. It can be quite a sleepy and stayed place, rather than one of booming music and English pubs selling Shepherd’s Pie and John Smiths Creamflow bitter. However, for us, it worked well as we just wanted a peaceful time in the sun. I did form a tenuous bond with a French guy I played football with as we were of similar age, standing out in a group of teenagers and twenty-somethings like the nearby lighthouse. This resulted in passing jokes about our ageing bodies in broken English and French, followed by a brief but warm handshake. That’s just dandy for me. Of course, the weather was predictably fabulous, the food was great, and Menorca is a beautiful island that is well worth a visit. It was nice holiday; back to clouds and reality now, but it’s nice to see the dog who greeted me like a returning war hero. No Replies to "Back From Menorca!"